Home to both New Zealand's capital city and its most populous one, North Island remains the more urbane and modern of the country's two main islands. With a wealth of museums and places of historical importance, the island tells the story of New Zealand's inhabitants, from the native Maoris and European settlers to the cosmopolitan and inclusive population of the modern era. Away from the industrial and cultural centers, a tour of North Island can take you through the impressive and world-renowned landscape of deep gorges, rolling rivers, enormous lakes, and areas of volcanic activity--home to an amazing biodiversity of terrestrial and marine animal and plant life. Active vacationers on North Island may appreciate the extreme sports, and don't miss a chance to relax in its hot water springs. Auckland: Combining a contemporary culture of galleries, museums, and performance venues, along with plenty of green spaces, this waterfront city is New Zealand's most populous and one of the world's most booming urban areas. Wellington: This national art hub boasts museums, festivals, and events, all against a backdrop of eclectic architectural styles and rugged nature. Taupo: This resort town on the banks of Australasia's largest body of water provides the perfect starting point for a variety of activities including hiking, mountain-biking, trout fishing, and a range of water sports, plus views of the lake and surrounding forests. Rotorua: Geothermal landscapes and lakes define the surroundings of Rotorua, setting the scene for a classic North Island itinerary of hot springs, hiking, and exploring Maori culture. Paihia: Central among the Bay of Islands, Paihia is a gateway for exploring the surrounding natural areas through cruises, dolphin-watching trips, and kayaking; back in town, attractions include long sandy beaches and architecture. Museum of New Zealand Te Papa Tongarewa: Discover the history of New Zealand and its Maori culture though a collection of artifacts, medieval clothing, fossils, and local arts all combined with high-tech installations. Sky Tower: Standing 328 m (1,076 ft), New Zealand's tallest structure rises over the business district, providing panoramic views of Auckland, glass-floor panels, and spectacular sunsets with cocktails from the tower's bar. Auckland Museum: From Maori artifacts to volcanic eruptions, discover New Zealand's rich heritage on your North Island vacation at this museum and war memorial, dedicated to Auckland's natural and military history. Skyline Rotorua: Hop aboard this gondola and experience the scenery of Mount Ngongotaha and surrounds, including Lake Rotorua. Atop the mountain, explore the walking trails, dine at the restaurant, or undertake an adrenaline-fuelled zipline or Skyswing. Huka Falls tracks: Called "Hukanui" by the native tribes due to their force, these falls gush out of a rugged canyon, falling into a spectacular freshwater pool. Wellington Cable Car: Departing from the city center, this five-minute cable car takes you up to Kelburn Lookout for expansive views over Wellington, as well as access to the botanical gardens, observatory, and cable car museum. Waitangi Treaty Grounds: Commemorating the site of the signing of the treaty between Maori chiefs and the British crown, these grounds include a historical museum and also host performances of Maori song and dance. 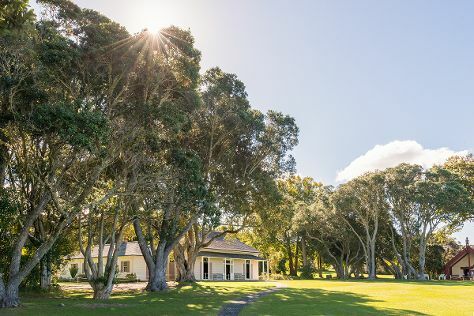 Devonport: With fantastic dining options and unforgettable views of Auckland's skyline, Devonport retains a bohemian charm in its main streets, well-maintained Victorian villas, and the Southern Hemisphere's first purpose-built movie theater. Tamaki Maori Village: Learn about the culture of the native Maori through an immersive and engaging experience that explores significant historical events, as well as their arts, traditions, and religious customs. Te Puia: A guided tour of the thermal geysers at Te Puia reveals some of the 500 hot springs, geyser explosions up to 30 m (98 ft), as well as cultural performances, feasts, and handicraft classes. A North Island vacation with children can be quite enjoyable, with a variety of destinations that combine energizing natural attractions and engaging cultural experiences. A visit to the Northland Region lets your family explore natural wilderness, sacred Maori sites, and possibly even some amazing wildlife. Auckland promises a variety of city tours and urban sightseeing, as well as a zoo, beaches, and parks where kids can let off some steam. Farther south into the heart of North Island, a trip to Rotorua will expose your kids to Maori culture, as well as a variety of spectacular natural geothermal sights and furry friends. At the southern end of North Island, Wellington is home to the country's national museum and a variety of zoos. North Island itinerary takes you, your family will find plenty of entertaining attractions. While in the Northland Region, join a dolphin sightseeing tour or visit Ninety Mile Beach, known for its swimming, beautiful sunsets, and sandboarding. Explore the uppermost tip of North Island at Cape Reinga, a sacred site for the Maori people where it is believed that spirits proceed into the afterlife. When in Auckland, Auckland Zoo will keep the entire family entertained with both native and exotic species, as well as daily encounters and tours. A trip to the top of Sky Tower will wow the kids with views of the city and surrounds. Heading south into the center of the island will present you with a variety of all-ages attractions. Fans of "The Lord of the Rings" and "The Hobbit" films should pay a visit to Hobbiton, featuring miniature dwellings from the series. At Te Puia meet adorable kiwis, watch traditional Maori performances, and witness natural geyser eruptions. Within the nation's capital, take the children to ZEALANDIA Sanctuary, where they can see some of New Zealand's rarest wildlife, or to Wellington Zoo. When planning your North Island holiday, remember that not all attractions may be of interest to children, depending on their age. Consider renting a car so you can go at your own pace, spending at least two nights in each destination. Hotels, motels, hostels, and holiday parks usually provide family-friendly accommodations. New Zealand is a safe country, with friendly locals and an acceptance of children and families. Kids are also generally able to participate in adult adventure activities such as bungy jumping, but age restrictions may apply. A gastronomic tour of North Island presents a diverse array of choices, from local wineries and traditional indigenous cuisines, to sophisticated restaurants. New Zealand-style dishes draw from the land and sea, featuring lamb, pork, venison, Bluff oysters, sweet potato, kiwifruit, scallops, and more. Central North Island is a great place to discover traditional Maori food, slow-cooked in underground ovens ("hangi"). Hangi dishes may include fish, chicken, pork, and/or vegetables, and are a must-try. Experience this at Matariki Hangi & Maori Cultural Performance in Rotorua, or the Waitangi Treaty Grounds in Paihia. The center of the island also boasts renowned vineyards, fruit orchards, and food producers. The Hawke's Bay Region is a premier destination for food and wine, where you can dine on geothermally farmed prawns and traditional hangi food. Make time in your North Island itinerary to shop for Maori handicrafts, local culinary treats, and smart fashion. In Auckland, visit Pauanesia to purchase housewares and gifts with a Polynesian and Kiwiana influence. The Mangonui Craft Market in Karikari Peninsula tempts with local olive oil, jams, kauri carvings, and country-style home decor. Also nearby is Flax Bush, selling seashells, woven flax, and other Maori crafts. Fashionistas should check out Auckland's hip designer boutiques. Take home a taste of North Island by perusing the stalls at Hastings Farmer Market, selling everything from eggs and vegetables to meat and preserves, or La Cigale French Market, a French-style market with fresh bread, cheese, chocolates, and more. * Of New Zealand's 4.5 million inhabitants, one third live in Auckland. * Mount Ruapehu in the middle of North Island is part of the Pacific Rim of Fire and one of the world's most active volcanoes. * Lake Taupo was formed by one of the world's largest volcanic eruptions in the last 5,000 years. * North Island is home to the majority of the dairy, wine, oil, iron, and coal industries of New Zealand. With a year-round calendar of festivals, holidays, and events, you'll have many opportunities to add local color to your North Island vacation. From late February to late March on even-numbered years, Wellington hosts the New Zealand International Arts Festival, creating encounters between artists and audience, and showcasing both local and international talents. During the Easter period, visit the Royal Easter Show in Auckland, or the National Jazz Festival in Tauranga. If visiting in spring, stop in the Taranaki Region to view public and private gardens during the Taranaki Rhododendron and Garden Festival. Over the Christmas and summer period, the Festival of Lights is held in Pukekura Park near New Plymouth, when the botanical gardens transform into an illuminated multicolored wonderland. When planning your North Island holiday, you'll need to consider the climates of different locations, with the Far North known for subtropical weather during summer, and the rest of the island experiencing more temperate weather. The coastal city of Gisborne, for example, has mild temperatures, moderate rainfall, and abundant sunshine throughout the year. New Zealand's warmest months are December through February, while the coldest months are June to August. Average temperatures during summer are 20-30 C (68-86 F), and 10-15 C (50-59 F) in winter. Two of New Zealand's sunniest areas can be found on North Island: the Bay of Plenty and Hawke's Bay, each said to receive over 2,350 hours of sunshine each year. Rain is considerably more likely during the winter months of June to August, with Rotorua experiencing an average rainfall of 130 mm (5.1 in) during winter, and 100 mm (4 in) during summer. Napier on the eastern coast has an average winter rainfall of 80 mm (3.1 in) and 50 mm (2 in) in summer. Traveling around the region during your holiday on North Island is easy, with the option of a variety of daily flights between domestic airports on the island proper, as well as to and from North Island via the international airports of Wellington, Hamilton, Palmerston North, and Auckland. Domestic airports service the Bay of Islands, Gisborne, Napier, and a selection of other destinations. Buses are a viable option when moving between larger cities, although rental cars or RVs give you more flexibility. A railway connects the two largest cities of Auckland and Wellington, providing a scenic route of travel through North Island. These same cities also have well-connected local public transport networks including trains and buses. Ferry services make frequent--and beautiful--trips from North Island to South Island.